Padded leather or cloth, it doesn’t matter — leisure chairs are a great item for any recipient who appreciates luxury and comfort. Those lucky enough to live near a Menards can find themselves a Microfiber Rocker Recliner for just $99 after a mail-in rebate. Macy’s, similarly, is offering a two-for-one deal — $499 for two Landon Recliners. Looking for a gift the whole family can enjoy? No problem. Macy’s is offering three-piece sectional couches for $1,499 and two piece leather sectionals for $1,399 and $1,699. Looking for a better deal? Kmart has you covered with a Malcolm Bonded-leather sofa for $289 this Black Friday. Hiding things away in plain sight while keeping your home stylish doesn’t need to be difficult. Store things easily and chicly with Meijer’s five piece ottoman set in black or brown for just $70. You can also grab a Duke Storage Ottoman for $99 ($90 off its normal price) at Just Cabinets as well. Everyone needs something to plop their computer, papers or books on. Why not start with Just Cabinets’ deal on the Stonybrook Writing Desk? The marble top desk is available for $399 — a $360 discount from its normal price. Not looking for a marble finish? OfficeMax has what you need with working desks ranging from $69 to $139. Of course no desk is complete without a quality chair — a chair which usually costs a pretty penny. But don’t break your bank to save your back — you can find fantastic deals on rolling chairs (complete with leather padding), ranging from $79 to $149 at OfficeMax. Put your new trophy television on the stand it deserves. If you’re a member of the military, you may want to check out AAFES — a.k.a. The Exchange — for discounted Whalen TV stands. For the rest of us, big box retailers are offering massive deals on stands. Walmart, for example, is offering a stand which can hold a 45” to 70” television for $129. Toss out that Ikea table you’ve held onto since college and get yourself a real grown-up dining table. Macy’s has two deals on seven piece dining sets — $1,099 for a 40″x62″ table and six chairs and $1,199 for a 42″x72″ table and six leather upholstered chairs. These may not be the most obvious gift in the world, but you do spend a good portion of your life on your bed. Get yourself the best deal you can without skimping on comfort this Black Friday. Macy’s is offering its queen-sized MacyBed memory foam mattress set for $349. Sears Outlet, too, is offering some major deals on its mattresses, like 60 percent off for New Nature’s Sleep memory foam and New Sealy mattresses. There’s no better time to spruce up your bathroom. Lowe’s is offering a fantastic deal on bathroom vanity cabinets for $179, helping you organize your essentials and personal items with an attractive piece of furniture. Put linens, books and DVDs in their place with Just Cabinets’ Shadow Door Cabinet for $299. These are some of the highlights being offered by the biggest-name retailers so far. 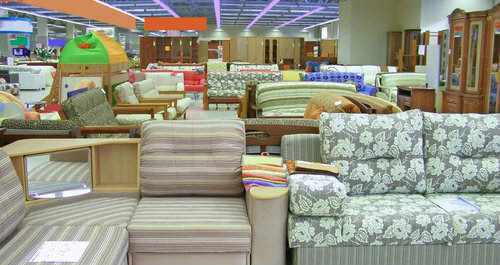 Smaller, local stores may also offer great deals on any type of furniture set you’re looking for. And don’t forget about antique stores — old-fashioned furniture never goes out of style. Regardless of what you do, plan ahead and look for quality pieces that will last for years to come! Store photo courtesy of Shutterstock.